Just because you are thirty (30), doesn't mean you still can't be flirty! Head to the bar with your friends in this 30th Satin Sash and see how many people will offer to buy you a drink! 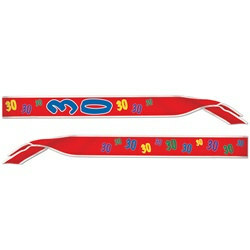 This birthday sash is a great way to stand out on your 30th birthday and get all of the attention you deserve. It is made of a red satin fabric with various sized 30s printed in many different colors. This 30th Satin Sash is approximately thirty-three inches long, so it will fit most sizes and look great on everyone. Turning 30 is a time to celebrate, so make this birthday count!